As the cool autumn air begins to reach us here in Ohio, we turn to thoughts of Buckeye Football and preparing our lawns & landscapes for the return of winter. Fall is also one last chance to get some late blooming out of your blooming plants. So get out your best Gratefull Dead t-shirt, because it's time for some DeadHeading Tips! The "deadheading" method has been practiced for many years as a way to promote additional blooms out of plants. The method involves removal of a plants "spent" flower buds by pruning or trimming them off, allowing for new growth. While it's never a great idea to prune and trim shrubs/trees during the summer, the early fall is a great time to promote new growth in your shrubs due to favorable weather conditions. The idea behind deadheading a plant is to remove spent blooms from the plant. For plants with several blooms, taking shearing scissors and cutting about an inch below the spent bud is sufficient. However, for a plant with many blooms, this process could take a great deal of time. That's why in this case, using a long bladed hedge shear to trim the entire shrub is a good idea. Daylillies and perennial grasses are known for their long stems with flower buds on top. When they complete their flower cycle, the bud and the stem harden and start to wilt. To force another bloom, these flower stems must be trimmed back to the base of the plant. While removing dead flowers off your plants keep a clean look, there are reasons you may want to reconsider "deadheading" a plant. 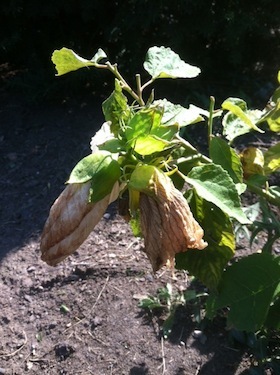 When plants buds are allowed to dry out, they fall off and set their seed. This is especially effective when trying to fill in large areas with the same plant variety. However, if you apply a pre-emergent weed control in your beds, the seeds will not germinate.